“I want him brought to me alive. He’s no good to me if he’s not breathing, you understand?” And that one chilling sentence from man-without-mercy Bull O’Kane to his hired hitman, The Traveller, sets the pace for this engrossing and page-turning book from Irish author, Stuart Neville. Neville’s tension-driven debut novel, The Twelve (published in the U.S. as The Ghosts of Belfast), garnered excellent reviews in America and Europe and won him the Los Angeles Times Book Prize. The Twelve told the story of IRA man, Gerry Fegan, trying to still the voices of those he killed in the conflict in the North of Ireland, between British and Irish combatants. Collusion is the sequel to that book. Fegan has now left Belfast and finds himself trying desperately to hide from his past in New York City. But the past, as Fegan is soon to discover, is almost impossible to hide from, making the future even more doubtful. Equally daunting is trying to rectify mistakes from that past, especially if one of those mistakes was sparing the life of O’Kane, who now has his deadly sights on Fegan and a few others. Too many witnesses survived a bloody battle at O’Kane’s border farm, and now he wants all of them silenced, be they man, woman or child. O’Kane hires The Traveller, a deadly psychopathic assassin, to do his dirty work for him. Into the violent mix comes Detective Inspector Jack Lennon, father of one the witnesses. Lennon soon finds himself caught up in a web of official secrets and lies as he tries to uncover the whereabouts of his six-year-old daughter, Ellen, and her mother, Marie McKenna, both of whom were at the farmhouse on that bloody night and are supposedly under police protection. But the closer Lennon gets to the murky truth about the events on O’Kane’s farm, the more his superiors put pressure on him to back off, and doors are slammed firmly in his face. Fortunately, Lennon is not the sort of man to back off when it comes to family and getting to the truth, and his obdurate determination to open those doors sets the inevitable collision course for the main characters in Collusion. Putting aside old animosities, Lennon and Fegan are forced to team up, but can they match the ruthlessness of The Traveller and Bull O’Kane? Will Lennon be willing to do what has to be done to save his daughter? 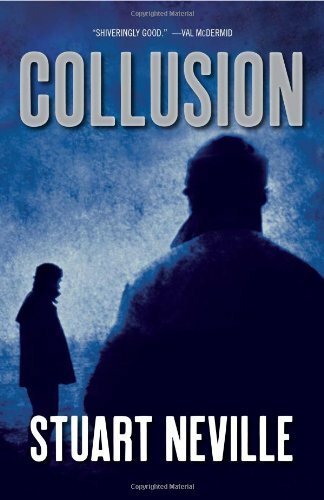 Corruption, official cover-ups, and bloody murder make Collusion a fast-paced, neck-snapping thriller with a gritty style that makes it impossible to put down. A great read to be snuggling down to in the coming winter nights.